Preheat oven to 450° F. In a small bowl, combine pizza sauce and diced tomatoes; set aside. Add pre-cooked meat ravioli to a medium-sized skillet and heat on medium low until warm; set aside. Spread sauce on crust, leaving a 1" border around the edge. Sprinkle 1 cup of mozzarella cheese onto sauce. 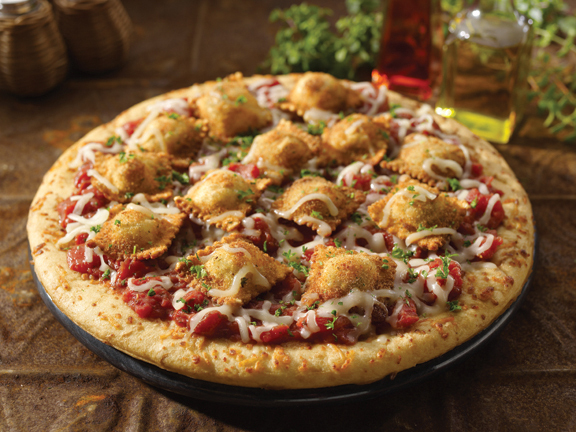 Arrange ravioli in a single layer and top with remaining 1/2 cup of mozzarella and the Parmesan cheese. Bake for 8–10 minutes until crust is light brown and cheese is melted. Top with fresh parsley.